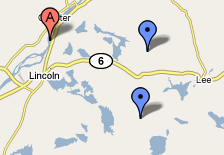 LINCOLN, Maine - A Massachusetts firm that is Maine’s first and largest wind power producer will seek tax breaks from four Lincoln Lakes towns that will host its proposed $120 million wind farm, officials said Wednesday. If all goes well, First Wind will be applying by the end of the year for permits to build 40 1.5-megawatt windmills creating as much as 60 megawatts of electricity on sites in Burlington, Lee, Lincoln and Winn. Concurrent with that effort will be applications to secure tax-increment financing deals from those towns, said John LaMontaigne, First Wind’s spokesman. Such tax breaks, LaMontaigne said, provide "a critical foundation that helps us ensure the viability of the project." "We have spoken with officials [from the towns], and they have been receptive to the idea," he said. "TIFs provide tax stability, or certainty, that we find very helpful." When a town realizes an increase in valuation created by an investment, it also experiences a reduction in its share of state revenues and an increase in county taxes. A TIF allows a town to "shelter" the new valuation from the calculations of state revenue sharing, education subsidy and county tax assessment — in effect creating more money for the town, usually over 20 years. With a TIF, however, the money that a town gains must be invested in community economic development projects, such as industrial parks or infrastructure improvements that aid businesses. In 2007, TIFs given to Lincoln Paper and Tissue LLC and other companies brought Lincoln about $238,000 in captured tax dollars that the town invested in itself, Economic Development Director Ruth Birtz said. The investments include funds reserved for the development of Lincoln Industrial Park West, a proposed industrial park to be located near Lincoln Regional Airport; a new GPS mapping system the town uses; new streetlights downtown; several downtown beautification efforts; and the budgeting of some salaried positions, Birtz said. "Because the cost of developing those turbines is so expensive, it helps give them a little more breathing room on their high investment," Birtz said. The windmills would be built on two sites on the Rollins Mountain range and Rocky Dundee Road areas that run north to south through Lincoln from Burlington to Lee and Winn, LaMontaigne has said. Lincoln would have 19 or 20 turbines; Winn, three; Lee, seven; and Burlington, 12. Two turbine sites are listed as alternates. The company also would install a 115,000-volt transmission line that would run from the north end of Rollins Mountain to a Mattawamkeag connection to the New England grid. Evergreen Wind Power LLC, a subsidiary of First Wind, would begin seeking permits by late summer. Construction would finish in late 2009 at the earliest. First Wind is building a 38-turbine farm in Stetson Mountain between Danforth and Springfield and operating a 28-turbine wind farm in Mars Hill. Those communities have also secured TIFs for the projects. are you for or against the rollins wind project?